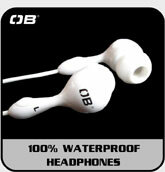 Overboard Waterproof Headphones, Best MP3 Headphones. Best quality and value for money. Good quality comfortable waterproof headphones that fit standard MP3 player audio jacks & cases. The Overboard waterproof headphones have a comfortable in-ear design bud for use with all types of sports and activities, and sound great above and below the water.These are our best MP3 headphones in terms of value for money. Waterproof speakers designed for complete submersion. Available in White or Black. Good quality ear bud style waterproof headphones. Neodymium bass response driver. See tech spec. Frequency response 19Hz - 20Hz. Sound Pressure Level 100db (1 kHz/1Vrms). 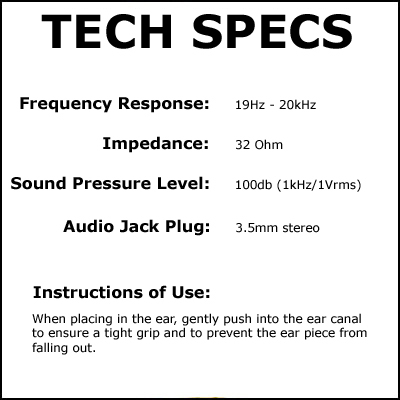 Compatible with standard 3.5mm audio jacks e.g. Overboard and Aquapac cases (not compatible H2O Audio cases). The Overboard earbud secures the speaker firmly in the ears and keeps water out. Designed for use with all music players and guaranteed to a depth of 19ft / 6m.